Has the mood to craft ever hit you but you want to keep it easy and not something that will take a lot of time? Let me introduce you to the Make It Now Projects in Cricut Design Space. All of the planning and prep work is done, you simply cut your materials and begin assembling! 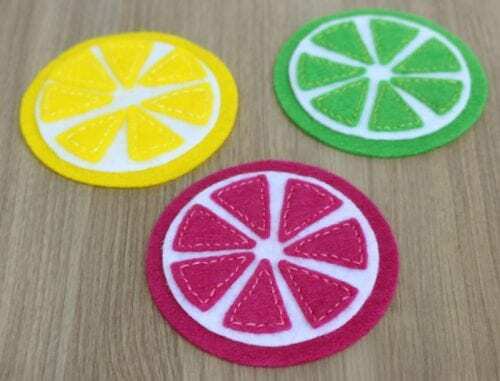 The project we are making today is the Citrus Coasters. This is one of the free projects that come with the Cricut Maker. You can read my full review of the Cricut Maker here, but as a spoiler, I LOVE THIS MACHINE!! This is a really simple project with a couple of different ways to put together. 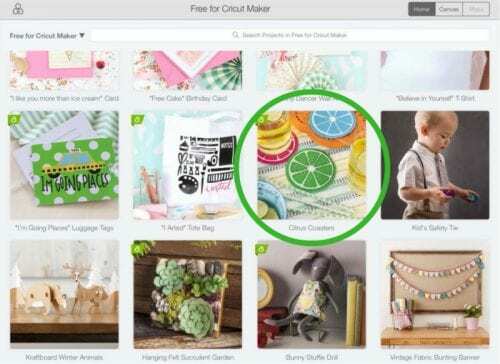 Begin by selecting the Citrus Coasters in the Free for Cricut Maker section of the My Projects in Cricut Design Space. Here you will see written instructions for assembly as well a list of materials you’ll need for the product. You can even print this out if you prefer the paper copy! At the bottom of the instructions, click on “Make It”. This lays out your project on the mats needed and even color codes them so you can easily see what color of felt is needed for the next mat. Click the green round Cricut icon in the bottom left corner to send the files to cut to your Cricut Maker. Select felt as your material and make sure you have the rotary blade installed in your Cricut Maker. 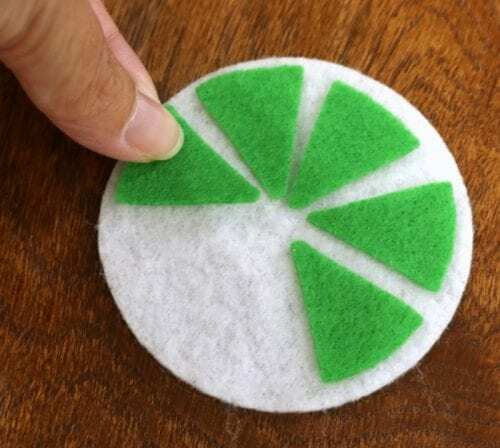 Then follow the prompts on the screen to cut out the felt pieces. This project has a total of four mats since we are cutting four different colors of felt. But don’t worry you can use the same mat each time. 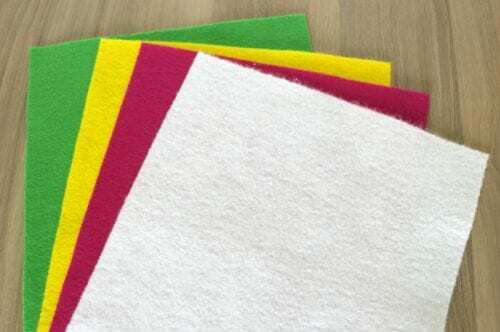 Simply cut the first mat, unload, remove the cut felt pieces then lay the next color of felt on the mat and load the same mat back into the machine. 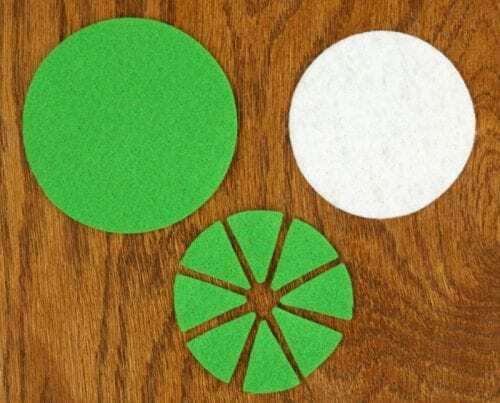 Even though we are cutting out four mats or four colors of felt, this project makes 3 felt citrus coasters. Each coaster will consist of one white circle, one colored circle, and 8 colored triangle pieces. When assembling the pieces you have 2 different options. You can hand stitch the triangles into place or simply glue. Here is what the two different options look like. The top row was glued while the bottom row was stitched. I personally like the look of the stitched coasters better but the stitching does take more time to do. So it is totally your call on how you want to make them, and I will give instructions for both! 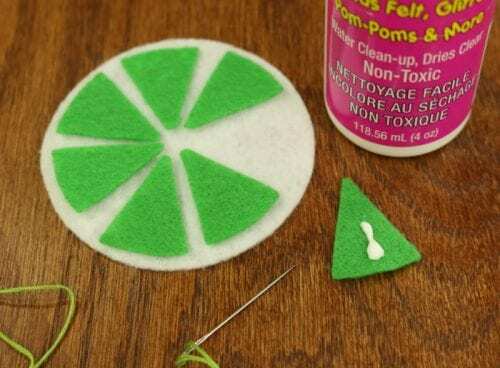 Before any glue is used arrange the triangles in the white circle how you want them to look. The Maker cuts 8 triangles, but I liked how it looked better only using 7. Once the pieces are arranged how you like them you can glue them into place. 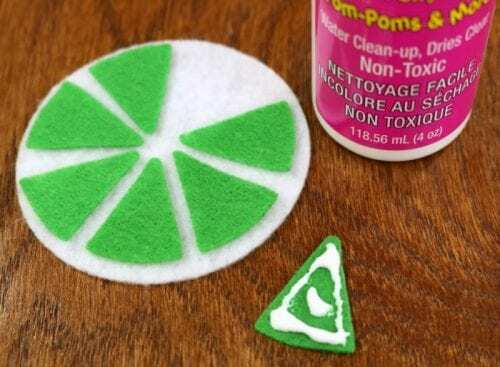 If you are only using the gluing method for assembly, you will want to make sure you get the glue around all of the edges and in the middle of each triangle so there is a good seal when the glue is dried. If you plan on hand stitching, you won’t need nearly as much glue. You only need enough glue to hold the pieces in place. 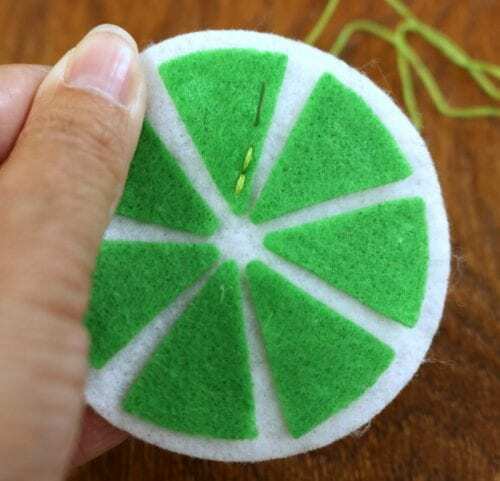 In fact, if you use too much glue and you want to hand stitch, it will be difficult to stitch around the edges if there is glue there. So only put a small dot/line of glue in the center of the triangle keeping the edges clear of glue, and press into place. If you are stitching, do your hand stitching next. Using three threads do a simple in and out stitch around each triangle. 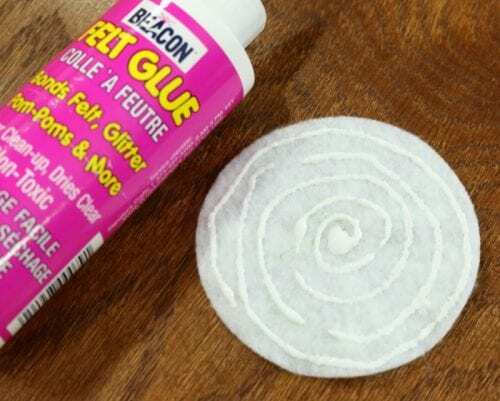 Next, apply glue around the edges of the back side of the white circle in a spiral. Center the white circle on top of the larger colored circle and press into place. That is it, you are done! I told you they were super simple to make! 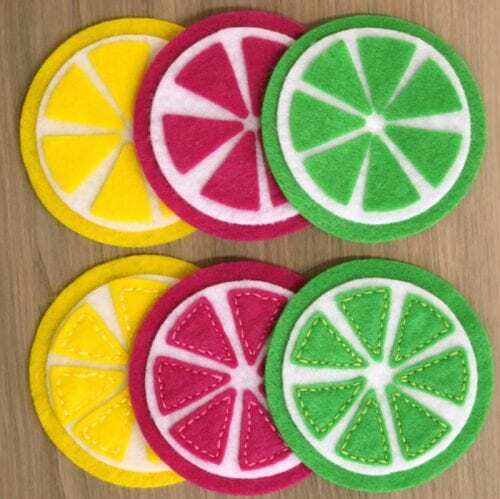 These Felt Citrus Coasters will make a fun gift, perfect for that summer neighborhood BBQ, or simply to use around the house cause they’re cute! How will you make them? With the hand stitching or the glue method? Share and leave a comment below! 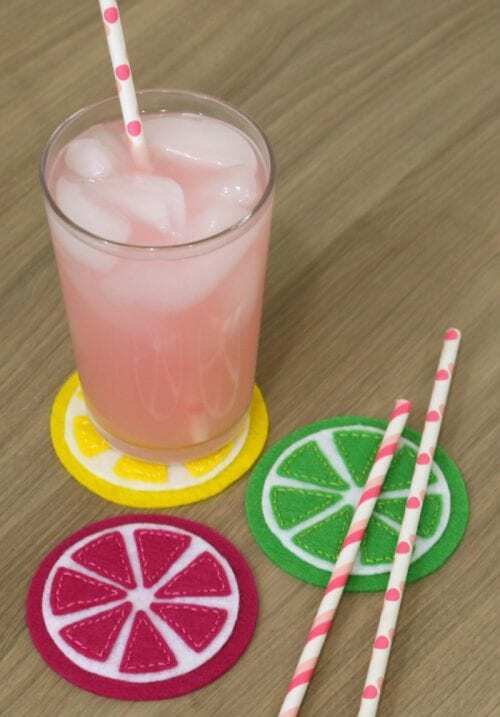 Do you want these coasters but don’t have a Cricut to make them? Buy them from my Etsy Shop! Click here to purchase. 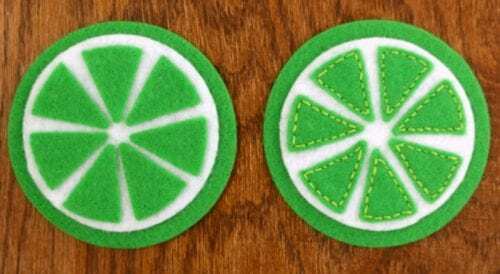 SAVE HOW TO MAKE FELT CITRUS COASTERS WITH THE CRICUT MAKER TO YOUR FAVORITE DIY PINTEREST BOARD! Let’s be friends on Pinterest so you can see all the DIY projects I’m pinning!